I'm late today, it's almost tomorrow. I started to vacuum today and got carried away with tearing things apart and before you know it it was late afternoon. Then I was exhausted! So didn't get to my stamp room (except with the vacuum cleaner) until after dinner. Today's card is for the first birthday of my daughters best friend's son, Jack. The big day is November 22nd. He is a sweetie. immediately fell in love with it and ordered it. It also comes with the sentiment, There's nothing like comfort food! Isn't that so funny! Thanks Steph, loved your beautiful card. So lovely, I can understand why you had to order this cute stamp. 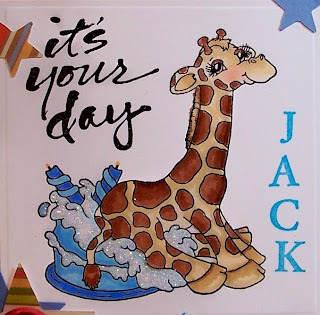 such a cute little card for little Jack! GREAT! I hope you are well Sue! Are you in holiday season mood? I´m busy in baking and decorating the house. big hughs to you my dear friend! wow what a cute giraffe your card is gorgeous sue. Sue just precious. 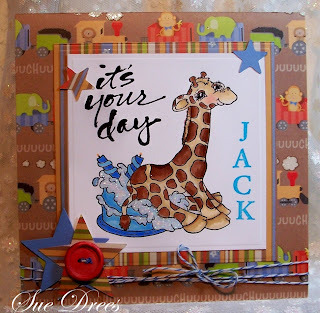 The image is adorable and I love how your personalized the card for Jack. The stars and twine a wonderful additions. This card will certainly put a smile on little Jack's face. its a fabulous card!!!! love the image and colours!!! a beautiful card have you made. I agree with everyone on the fact that this image is really adorable! Fabulous card you made with it!